In this webinar we discuss various DL applications and the optimized Intel DL environment including hardware, software, and tools. Ravi and Andres will explain the difficulty in scale training across multiple nodes and what Intel is doing to improve scaling efficiency. Various hyperparameters use to train DL networks are explain with a particular focus on Caffe. This webinar introduces MEGWARE’s certified Intel® Select Solution for Simulation and Modeling, an optimized platform specifically tailored to deliver stellar performance in all kinds of HPC applications. Backed by the power of cutting-edge Intel® Xeon® Scalable processors and supplemental Intel® technologies, MEGWARE offers a carefully pre-configured solution for those workloads including computational fluid dynamics (CFD) and computer-aided engineering (CAE). With more than 28 years of experience in building High-Performance Computing Clusters, MEGWARE has proven to be one of the leading vendors in Europe. Also, MEGWARE puts a strong focus on R&D with various software and hardware products developed in-house. One prominent example is the hot-water direct liquid cooling solution ColdCon® supporting high coolant inlet temperatures of up to 55°C. Hence, the Intel Select Solution for Simulation and Modeling is not only available with standard air-cooling but alternatively TCO-optimized with MEGWARE's extremely efficient ColdCon® technology. Scientific simulations and modeling continue to produce larger and larger data sets. For our brain to understand and digest these vast amounts of data, visualization becomes an indispensable tool for post-simulation processing. Data produced by simulations is therefore often copied to high-end workstations and servers with special-purpose GPUs. As simulations continue to grow, moving and copying data becomes increasingly inefficient, time consuming, and wasteful of resources. The Atipa Polaris Select HPCV Cluster Family built on Intel Xeon Scalable Processors and Intel Omni-Path Fabric technology is the industry's first unified platform for scientific simulation and visualization. Using Intel Xeon optimized rendering engines, Atipa Polaris Select HPCV clusters offer in-situ visualization of big data on the same HPC system used to generate the data, eliminating the need for wasteful data transfers and special purpose hardware. Enterprises need to be agile and innovative. But what IT departments need to provide to the business and what developers require to create innovative and agile solutions can pose some challenges. The role of IT has fundamentally changed from “supporting the business” and “fixing IT problems” to delivering transformative business outcomes. IT is now at the core of the business. The explosion of data and the desire to use it to drive innovation and decision making has placed new demands on IT, requiring more agility, performance, security and reliability. In this webinar we will discuss how building a hybrid cloud using VMware Cloud Foundation, Pivotal Container Services and Pivotal Cloud Foundry solves those challenges while saving enterprises money, improving developer and customer satisfaction, and eliminating shadow IT. As software developers move to micro-service and cloud aware application frameworks, IT and DevOps professionals are having a harder time untying the complexity of managing multiple environments across multiple clouds with the number of artifacts increasing exponentially. Just like Alexander the Great, we will look at techniques and principles that cut through the Gordian knot that is being tied by the invisible hands of complexity. Are you sold on the idea of hybrid cloud but questioning how to bring your strategy to life? This webcast will offer insights into Intel architecture benefitting the business value and primary use cases of Microsoft® Azure Stack. Intel Select Solutions for Azure Stack deliver an optimized, hyper-converged platform, with the Intel® Xeon® Scalable Processors, Intel® DC SSD, Intel® Optane™ SSD, and Intel® Ethernet Connections featuring iWARP that improve your Azure “on-premise” model for Microsoft’s Hybrid Cloud. Tune in to learn more about the reference design, the featured products, and solution configurations in this Intel-optimized, Microsoft Hybrid Cloud platform to enable you to go further into your hybrid cloud journey. In this webcast, Intel’s Director of Data Center Security Marketing highlights why blockchain is such a transformative technology and how Intel is working to solve the privacy, security, scalability, and trust challenges that will help drive enterprise adoption and accelerate blockchain deployments. Tune in to learn more about what products and services look like in a blockchain-enabled world moving forward. Runtime programming languages (Python, Java, Node.js, etc.) are seeing unprecedented growth in the data center. The reason? Dramatic changes in software development–with new applications built for the cloud—and increased pressure on developers to more quickly deploy applications. Runtimes can make or break the value proposition of a platform. This session discusses the impact of runtime programming languages in the data center and provides insight into the evolution of performance optimization and measurement in the cloud and enterprise. Intel is working with the broad industry ecosystem to develop new performance benchmarks and accelerates time to innovation by extending hardware capabilities into software through dynamic languages. • David C Stewart: Senior Director of Engineering, Datacenter Software Technologies, Intel Software and Services Group. Eric Dahlen, Senior Engineer, CTO, Cloud Platforms Group, Data Center Group, Intel Corp. This presentation will offer CSPs insights into advancing business models, infrastructure approaches and a customer centric view of optimization, both at the software and hardware layer. Hear analysis and proof-points that demonstrate how the latest capabilities delivered with the Intel® Xeon® cloud-ready platform enable optimization across several dominant and emerging workloads. Susan Bobholz, Fabric Alliance Manager, Connectivity Group, Data Center Group, Intel Corp.
Intel® Omni-Path Architecture (Intel® OPA) delivers the performance for tomorrow’s high performance computing (HPC) workloads and the ability to scale to tens of thousands of nodes—and eventually more—at a price competitive with today’s fabrics. Susan Bobholz, Fabric Alliance Manager, Connectivity Group, Data Center Group, Intel Corp, will give an overview of Intel OPA, talk about Intel OPA's key features, discuss why customers are choosing Intel OPA, and look ahead to new features and capabilities that will make Intel OPA even better. Jeff Witich, Director Cloud Service Provider Business, Data Center Group, Intel Corp. The world’s most advanced compute core features a new microarchitecture and delivers workload-optimized performance with innovations spanning every critical domain of your cloud data center—from compute to storage and memory to network to security. Every new generation of Intel® Xeon® processor-based platforms offer a leap forward in capabilities that deliver the industry’s best per-core performance with strong TCO/performance per $ to help Cloud Service Providers (CSPs) maximize ROI from their infrastructure and drive compelling end-user experiences. In this session, top Cloud Service Providers will share their expertise on the systems that are powering tomorrow’s advancements – smarter and faster. NFV and SDN have tremendous momentum, because these technologies promise communication service providers unmatched service agility, power and cost efficiencies, among many other benefits. Through its work with a broad ecosystem of partners and communication service providers, Intel understands the work required in the critical areas of Orchestration, Analytics, Benchmarking, Platform Optimization and Solution Stack complexity. Learn how Intel is helping communication service providers and partners address different aspects of NFV, SDN deployments with Intel® Select Solutions for NFVI and Intel® Select Solutions Fast Track Kit for NFVI. Intel® Select Solutions for NFVI is optimized, verified solutions from a broad ecosystem targeting today’s complex network workloads. Customers will be able to deploy infrastructure achieving reliable, secure and workload-optimized performance. Spend less time, effort and expense in evaluating hardware and software integrations. Intel® Select Solutions Fast Track Kit for NFVI are the result of Intel’s engagement with leading network operators to define the configurations and optimizations that work well for target NFV workloads. They provide integrated, tested and tuned hardware and software platforms that accelerate market evolution by providing Network Builders Developers with faster access to advanced platform configurations to speed availability of optimized, NFV solutions. High Performance Computing (HPC) is driving discovery across a broad range of fields, from astrophysics, to product design, to security. In this session, Dr. Bill Magro, Intel Fellow, Software and Services Group, and Chief Technologist for Intel HPC Software, talks about how the Intel Xeon Scalable platform and Intel's holistic HPC solutions portfolio are increasing HPC capabilities and enabling more customers to take advantage of HPC's value. As consumer and business applications generate even more data, companies need high powered computing (HPC) for transformation, movement and storage. 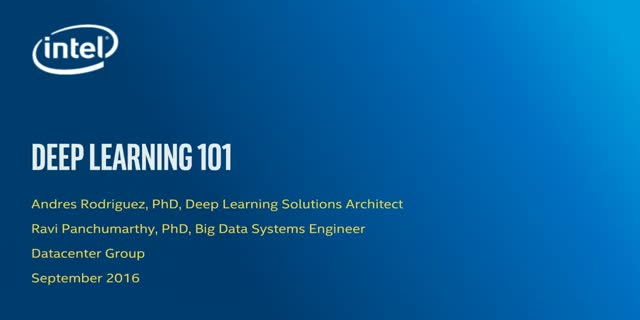 Just some of the workloads that are driving increased need for HPC are large data sets, analytics, AI, video processing, big data processing, machine learning, packet processing, etc. Tim Verrall, Senior Principal Engineer, Network Platforms Group, Intel Corp.
Network Function Virtualization is the way of the future, but NFV poses challenges in the area of service assurance. Communication service providers deliver services based on service level agreements. Downtime and failures can result in costly penalties and fines. These service providers must be able to provision applications, perform maintenance, manage operational cost and manage SLA for customers. They do this by measuring and tracking network performance with early detection and fault resolution capabilities. Learn how NFV changes performance, security and monitoring requirements compared to traditional, fixed devices. Find out how Intel® Xeon® Scalable will support performance, security and service assurance as companies transform their networks in preparation for 5G. Learn how to shift IT strategy from modernization to transformation. Organizations must prepare for enormous data storage requirements. Find out how Intel and its new Intel® Xeon® Scalable processors and Intel® SSDs are helping companies prepare to thrive. Come learn about how to get started programming with Open Programmable Acceleration Engine (OPAE). OPAE is a part of the Acceleration Stack for Intel® Xeon® CPU with FPGAs, a collection of software, firmware and tools, designed and distributed by Intel, to make it easier to develop and deploy Intel FPGAs for workload optimization in the data center. Intel and its partners share details on data center topics, best practices, strategies and more.